In my house, no one wears shoes during the summer months. We all wear flip flops. We even have fancier flip flops for church. After strolling through Michael's (the craft store), I got a few ideas on how we can jazz up our flip flops. My oldest daughter loved the idea. She is the one that insists on wearing unique items. She's my little fashionista. Most craft shops also sell fabric, but you can certainly pick up cheap fabric from a thrift store. There are several ways you can use fabric to jazz up your flip flops. You can cut it to fit the top surface of your flip flops, or you can cut strips to fit over the straps of the flip flops. Attach the fabric with a hot glue gun, or use a non-toxic adhesive for a more permanent solution. Make sure you wait for the glue or adhesive to dry before wearing the flip flops. Craft stores also sell fabric paint that you can use on the flip flop straps. Create a zig zag pattern, add polka dots, or make strips with the paint. 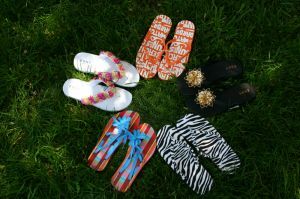 Use your imagination and make the flip flops reflect your own personal style. Once you have decorated your flip flops with fabric or paint, you can add a bow or flower to the center of the flip flop straps for added pizzazz. Again, you can use either a hot glue gun or non-toxic adhesive to get the bow or flower to stay in place. Of course, if you have a special charm, you could add that instead.